Taking care of your teeth is so important, not just for aesthetic reasons but for your overall health. Gingivitis is a disease that effects one in every two adults. If left untreated gingivitis can cause periodontitis; inflammation and infection of the ligaments and bones that support the teeth, which causes tooth loss. Many people don't even realize that they have gingivitis until it is too late. This is why good oral hygiene is so important. Both Crest and Oral-B are introducing products that not only prevent gingivitis, but are clinically proven to reverse gingivitis in four weeks. Crest Pro-Health Clinical Gum Protection Toothpaste: Is clinically proven to help reverse gingivitis and helps eliminate plaque at the gum line, while also inhibiting gingivitis-causing bacteria in the mouth. 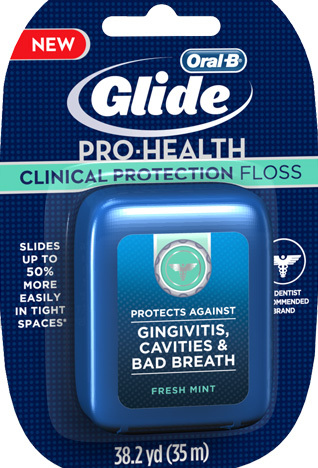 · Oral-B Glide Pro-Health Clinical Protection Floss: Infused with Crest’s highest level of special flavor ingredients to deliver a strong, fresh mint sensation during and after use. The flossing action helps reverse gingivitis in two weeks as part of a complete dental program. · Oral-B CrossAction Pro-Health Toothbrush: Unique Oral-B CrissCross bristles are angled in opposing directions to lift out and sweep away plaque, removing up to 50% more plaque along the gumline vs. an ordinary manual brush and reducing gingivitis in only four weeks of use. visit crestprohealth.com for more info.